Doctors and scientists agree that people who volunteer are more likely to be happier and healthier than people who don’t volunteer. Serving others awakens, energizes and exercises your heart both physically and, most importantly, emotionally. We exercise our minds and muscles, so why not exercise the qualities that come from your heart such as kindness, compassion and joy? An effective way to exercise your heart-center is to volunteer. Volunteer Wellness – The Chicken or the Egg? It’s not clear if happier and healthier people tend to volunteer, or if volunteering makes you happier and healthier. From my perspective, it doesn’t matter, just jump in. You may want to start a volunteer journal and capture your feelings, mental attitude and experiences after you volunteer. Or warm up to it- observe others and see how you feel. 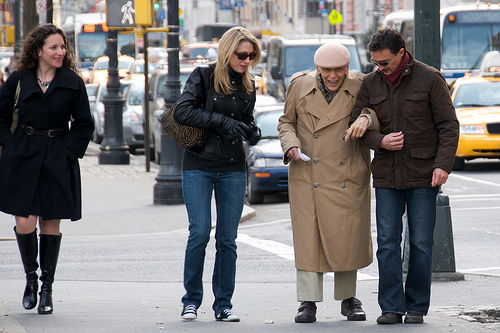 In the photograph, did you notice the woman smiling as she observes the couple helping the elderly man? As discussed in “When your Relationships are Good, Your Life is Good”, your attitude and intentions assist to create the best outcome. Are you serving from an ego perspective, or out of guilt? It is best to serve authentically. I often use this service intention: It is my intention to serve with skill, joy, grace and ease for the highest good of all concerned. The secret sauce, for me, is to serve as if no one is watching; to come and go without the need for anyone to know I was there. The higher your serving consciousness (in other words, the less your ego is involved), the greater the wellness effect for others…and for you. Very Smart Girls volunteer and energize their heart-center.